Legislators all around the globe are gradually shifting their focus from analog to digital means of communication. One of the effects: a growing number of laws concerned with regulating the content of corporate emails. If you fail to comply with them, you run the risk of receiving a severe penalty. On the other hand, the requirements are often moderate and may be fulfilled by as little as including a short disclaimer in your messages. But when exactly is this the case? Contrary to reports floating around on the web, email disclaimers are rarely specifically mentioned in legal acts, regardless if these acts focus on electronic correspondence exclusively, aim to regulate commercial messages in general or put restrictions on communication in certain branches of the economy. Neither are disclaimers a surefire protection against security breaches and lawsuits. Below I discuss to what extent legal systems in different regions of the world mandate the use of email disclaimers and determine their status. Applies to: All US companies transmitting patients’ personal healthcare data. Requirements: Implementation of appropriate administrative, technical and physical safeguards to guarantee the confidentiality of patients’ personal healthcare data. Email disclaimers: While HIPAA does not explicitly require healthcare companies to use email disclaimers, they are considered a supplementary measure used to discourage unauthorized use, disclosure or distribution of message contents. They are also a good method of informing patients about the risks related to sending their individual healthcare information via email. Applies to: Messages sent by financial institutions in the US. Requirements: Messages containing recipients’ personal information must be vastly protected – this includes using protected channels, encryption, etc. Email disclaimers: Since they do not ensure 100% confidentiality, they can only be used in an auxiliary capacity, e.g. to, quote: “Caution customers against transmitting sensitive data, like account numbers, via email or in response to an unsolicited email or pop-up message”. A broad set of rules governing written tax advice, which, due to the unclear formulation, used to cause a “this email does not constitute tax advice” disclaimer to be added to most messages sent by law firms. Starting from June 12, 2014, the Circular 230 rule that contributed to overuse of the “safety disclaimer” is no longer in force. Applies to: All commercial messages sent to recipients in Canada. Requirements: Aside from a few exceptions, Canadian users must always be given the option to provide express and informed consent before they receive any commercial messages from a company or individual. Messages must also include clear sender’s identification and a readily available opt-out mechanism. Applies to: All corporate correspondence. Requirements: Messages must contain the legal form of the sender’s company, registered office physical address, as well as information where the company is registered and under what number. If the company is being wound up, the fact must be stated. amount of paid up share capital (if the company has chosen to display shared capital). references to capital must include information on subscribed and paid up capital. information on capital, in cases when it has not been fully paid up; additionally joint venture companies (AG) must additionally specify the amount of share capital and total value of outstanding shares, while limited liability companies (GmbH) must specify the share capital value and, if it has not been paid up yet, the value of outstanding deposits. For traders who do not have a firm registered in the commercial register, § 15 b of the Trade Regulation applies, requiring that on all business letters that are addressed to a specific recipient, they provide their surname with at least one complete first name. The requirement does not apply to messages exchanged within existing business relationships, for which standard forms with separate disclosure rules are used. the fact that the company is run by a lease manager (locataire-gérant) or an authorized management agent (gérant-mandataire) (if applies). Applies to: All messages containing personal data of EU citizens (including ones exchanged within a work environment). Requirements: EU citizens’ personal information can only be collected and processed if the concerned party gives consent after having been informed in detail about the procedure. Collecting organizations must ensure that the information is not destroyed, altered, lost, as well as disclosed, stored or access without authorization. additional information, e.g. : recipients or categories of recipients of the data; if providing the data is obligatory or voluntary; a channel for inquiries and complaints. Examples of implementation of the directive in local EU member states’ law include UK’s Data Protection Act, Germany’s Federal Data Protection Act (Bundesdatenschutzgesetz) and Netherlands’ Personal Data Protection Act (Wet bescherming persoonsgegevens). Note: Monitoring of employees’ correspondence by the employer can also be considered to fall into the category of personal data processing. A common practice among both corporate and private users is to append emails with confidentiality disclaimers, waivers of legal responsibility, etc. The main point to stress here is that the status of these types of notices varies from country to country. Where one legislature may imbue them with indisputable legal substantiality, another can view them as unenforceable. The United Kingdom is an example of the former. Its existing law dictates that, if a message is expressly or implicitly confidential, a recipient cannot disclose its contents or use it for a purpose unintended by the sender (source: http://www.weblaw.co.uk/articles/legal-position-of-email-disclaimers/). It is evident that in this case stamping your email with an immediately visible confidentiality disclaimer makes all the difference. A person choosing to reveal the contents of such an email automatically comes into conflict with the law and is subject to penalty. This is less clear cut in the USA, where each case may go either way based on the ruling of the jury. It can, however, be argued that confidentiality disclaimers generally hold up in American courts, as do to a large extent notifications of sender’s lack of contractual authority (source: http://www.rhlaw.com/blog/legal-effect-of-boilerplate-email-disclaimers/). Two examples from one country may be little, but I think we can use them as proof that let’s call them “voluntary”, disclaimers should not be too hastily dismissed as void of any legal weight. In fact, based on the linked above article, they’ve been shown to get people out of trouble more than once. To conclude, as you noticed, my article does not cover the entire scope of international email disclaimer legislation. Countries I failed to mention may enforce their own unique or very similar laws. Judging by the current trend of increasing Internet regulation and the budding (one can hope) recognition of end-user rights to privacy and transparency, I would guess the latter is or will soon be true. As to voluntary disclaimers, if you’re still on the fence about attaching a standard one to your business emails, remember that regardless how the matter is treated by the legislation in force in your country or state, it can always be used as a supplementary measure informing recipients of potential legal ramifications of the correspondence, encouraging or discouraging certain behavior, or helping reduce damage caused by unexpected events. And the worst case scenario is that it will go unnoticed. NOTE: Information in this article does not constitute legal advice or legal opinions. You should not act or rely on it without first seeking the advice of an attorney. 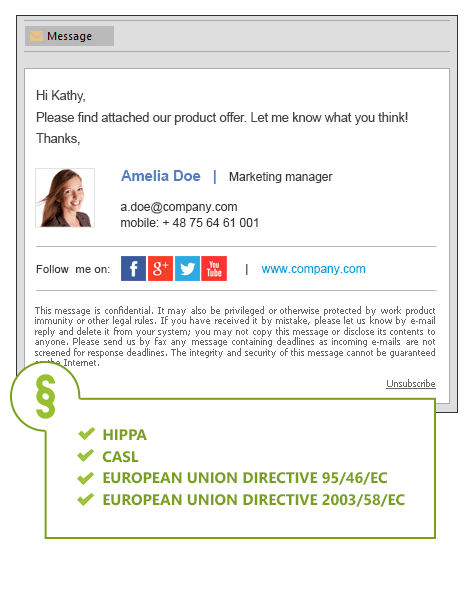 CodeTwo Exchange Rules: Automatic legal email disclaimers directly under latest reply/forward. CodeTwo Exchange Rules Pro: Full legal email compliance including legal disclaimers, email archiving, email content inspection and control, management of attachments, and more. Cool article. No Mexico laws? Maybe in part 2, but no promises. In any case, suggestions of specific laws I should write about are welcome.